Readers have asked for a post about how we store our television. 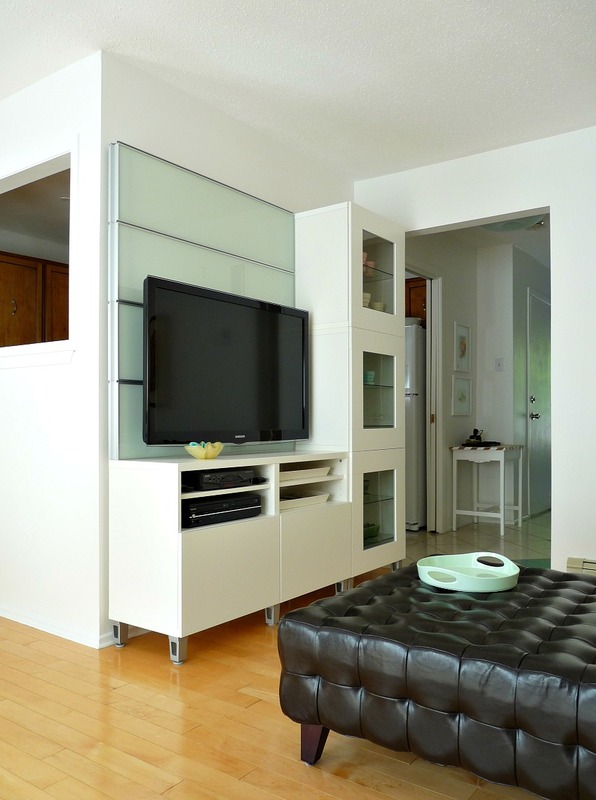 I’ve never blogged about it because our wall unit isn’t a DIY project, it’s modular Ikea furniture – the Besta series. It’s one of only three Ikea pieces we own and it isn’t perfect, but I love it for a few important reasons that I’m happy to share! When we moved into the townhouse, I made a deal with Hubby: we’d buy a new flat screen television but only once we had made a new unit for it. No way was a pricey, giant TV going on the wibbly wobbly dresser that held our tube TV (crash. boom. Tanya cries). 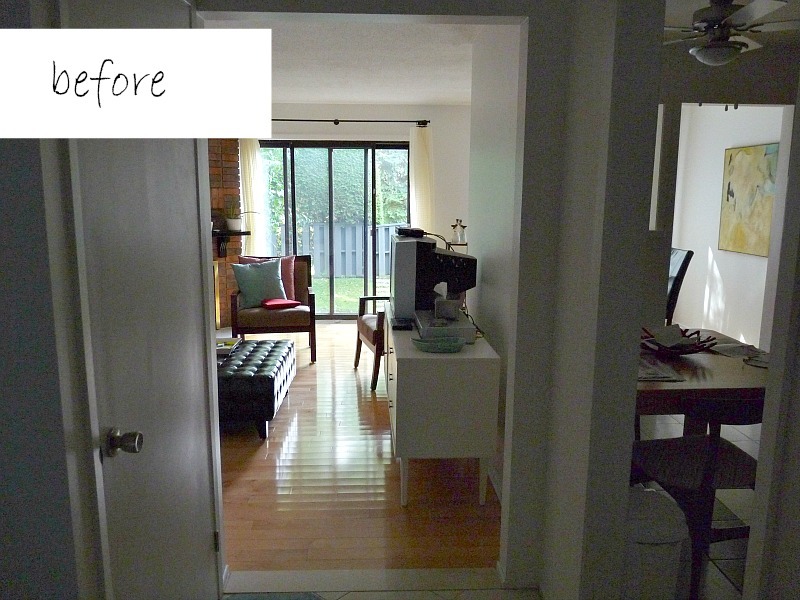 After months of planning and sketching we were no closer to the DIY wall unit dreams and Hubby was so, so sad. One day I turned to him and said “wanna just go to Ikea, get a wall unit and buy a TV this afternoon?” I’m not sure he’s ever loved me more. Making Hubby happy is reason number one I love the wall unit. Plus, I do love movie night with the bigger screen. The best and most logical living room arrangement (remember, it’s teeny) has the wall unit positioned as the first thing people see when they walk in the front door. Because we added a display cabinet to the right of the television, guests aren’t immediately hit over the head with the presence of our TV. In fact, it’s barely noticeable from certain angles. Before, the mid-century dresser I painted white left something to be desired and definitely made the TV more prominent from the doorway. From the other direction, it’s obviously a television, but the wires and everything are hidden. 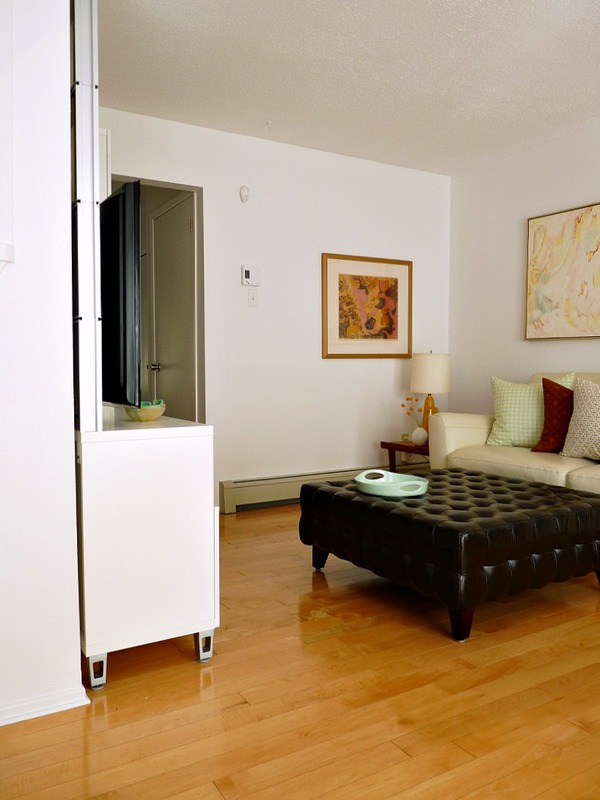 The television mounts to panels, which fit snugly to the wall and encase all the necessary cables. I would have preferred a closeable unit, with doors, but there just isn’t enough space for doors to open. Plus, the pretty sea glass green panels are perfect for the room. Much better than before, when you could see the wires, the back of the t.v. and the cable box (yes, I’m obsessed with the wires. I hate wires). I am not sure I could have designed a better unit (well, maybe now that I have had three years to concoct and execute a plan). I love the glass panel, the storage cubbies with glass shelves and doors. 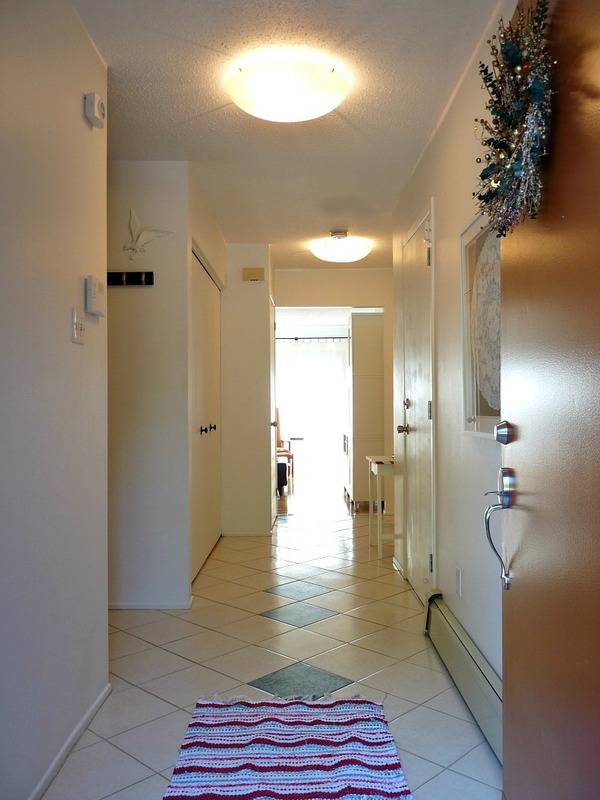 The white with glass is airy and, although the unit is large, it doesn’t take over the room. I’m not in love with the legs, but we sure as heck aren’t dismantling it to change them. One day I’d love a unit that is made of more quality materials, but so far this hasn’t failed us. 5. It just fits! Whew. Gotta love modular Ikea stuff! 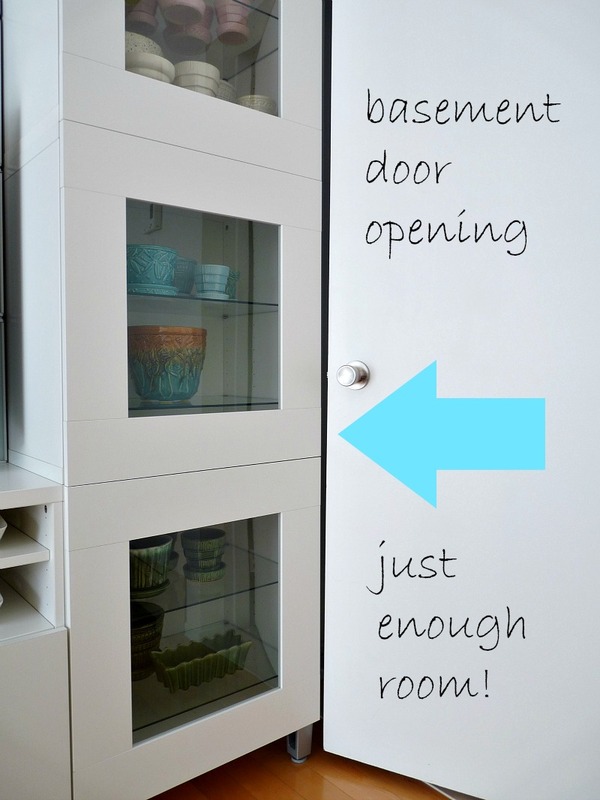 Our basement doors squeaks by the edge of the wall unit with little room to spare! 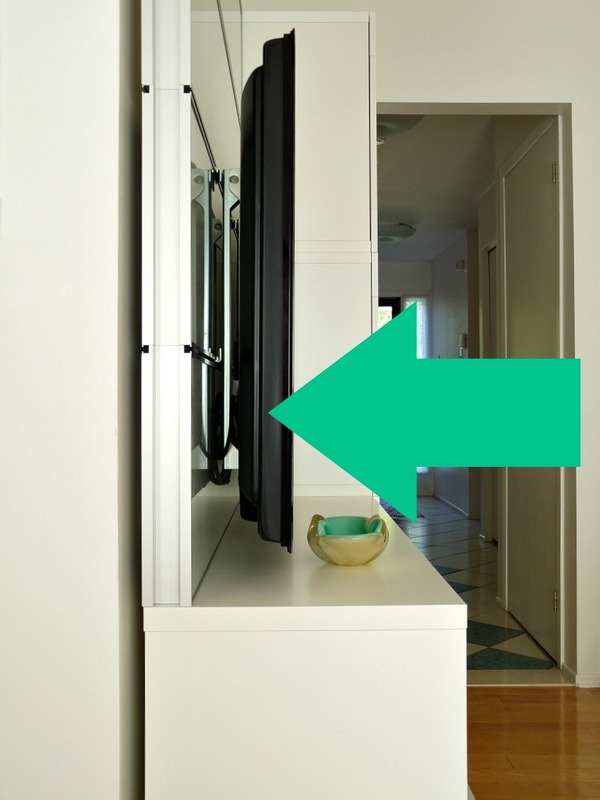 How do you store your television? I have gotten used to looking at ours, but long for the day it’s totally hidden. Did you buy a wall unit? Remake something into cool television storage? 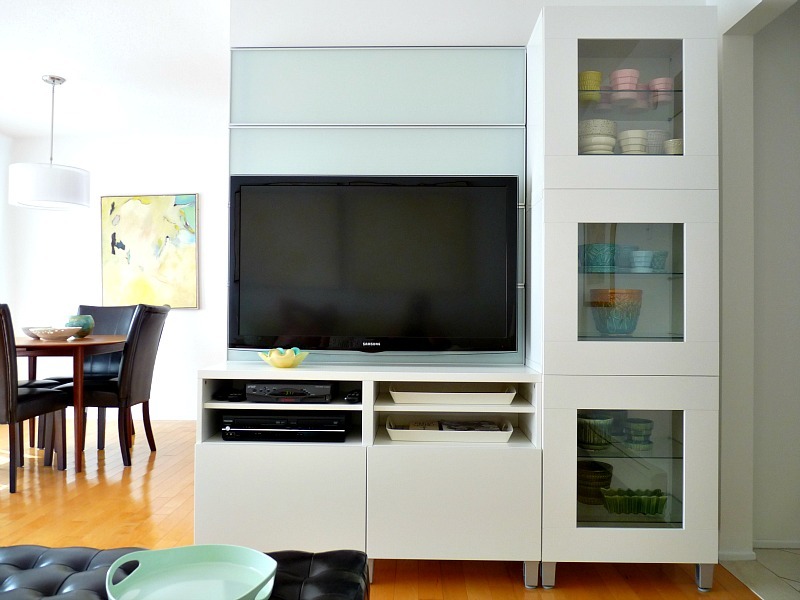 Share your link if you have a good TV storage idea! Oooh I've never seen this flash wall unit from Ikea! I still feel bad that I told my husband the only way he was going to get a flatscreen was if he carried it home himself… which of course he did! It currently resides on an Ikea shelf which rests on its side and houses books and general knickknacks. Haha – that is so cute! What some folks will do for a flat screen, huh? I was ambivalent until we actually got it and I realized how much more fun movies are! Great idea flipping a shelf over! I actually love this! Since the size is so perfect, it looks custom! It does look custom because I'm normally not lucky enough to have something store bought fit so perfectly!! An inch bigger and it would have been a no-go. Funny thing is, we didn't realize it would be such a tight fit and when we set it up and opened the door, we both held our breath and closed our eyes. Next time we'll measure better, to avoid the heart stopping drama! I wouldn't have even been enticed by a flat screen, if not for the slimmer profile. I definitely don't see the purpose in buying new tech just because it's new. I only upgrade when totally necessary (or when Hubby is glum about it, lol). If TV is not a big thing for you, keep the cash for something you do love! My television used to reside on an Ikea buffet unit I inherited when I bought my condo. The unit was huge, and white, and not really my style, but it was free, so I lived with it for over two years while I searched for something else.Earlier this year I found a lovely old sideboard on craigslist and refinished it myself. Here it is: http://sweetsuite10.com/2012/08/refinished-living-room-media-console/ I love it. Gotta love free stuff – it helps us save for what we love! I saw your refinished sideboard last time I was on your blog. It is GORGEOUS and the work you did looks sharper than what even a pro could do. Kudos to you! Oooo, yes, your bookcases look custom too with the built in look you created. Your giraffes were fun, too! Wine is pretty classy so wine boxes sounds like an awesome idea! If they are vintage wine boxes, you could end up on Apartment Therapy, lol. It never makes sense to rush into things. I will be jealous when you finally find a perfect unit which conceals everything. Honestly, I don't mind a tv that's out in the open, although I would really like to wall mount it. That's the plan once we have drywall instead of crumbly plaster walls! Darn those plaster walls! 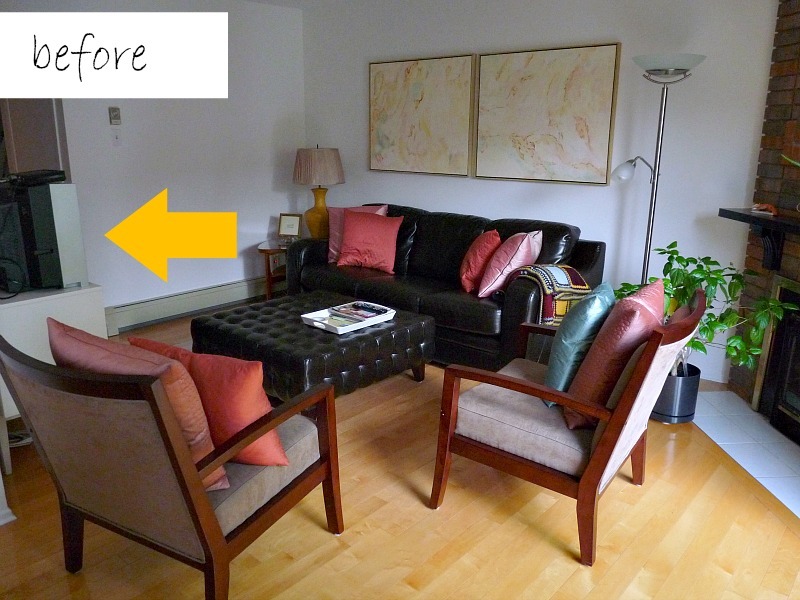 Wall mounting is another good option – very tidy and neat looking. When we first moved in together my fiance BEGGED for a bigger tv- but I said the same thing about the stand. A few months later we both had a surprise day off from work (we work in schools and there was a storm) and I just said let's go get both…. actually, I think I said let's go ge—- and then he was in the car, engine running before I could change my mind :). PS- hope you're doing well and plugging along with your thesis! I really really like the cabinet you chose. I think the sea glass back is my favorite part.I've never made any effort to hide a tv (or the wires even though they bother the heck out of me). We currently have the Ikea Vittsjo tv unit with the shelves and it takes away some of the attention from the tv, but it's still a main focal point. See glass is my favorite part, too, and it wasn't in the catalog. I spotted it in the store, in the display area, at the last second. Happy accident!The Vittsjo is cute, too! It's hard not to have TV's front and centre. We have a small TV in an awkward space, and we rent. My first choice is definitely to hide it away in a great piece of furniture, but because we don't know where we'll eventually end up, I opted to go with the fully exposed look instead. We converted an artist easel into a TV stand/media unit, so now everything tucks nicely into the odd little corner, and the whole thing looks sculptural with intention 🙂 Your stand is just incredible. The glass is awesome! I like the sculptural with intention look. Sometimes you just have to make art out of everyday objects. You're so clever, you come up with the most beautiful, inventive ideas (a certain lampshade comes to mind). My tv solution is simple — a laptop that sits on the arm of the couch! I haven't owned a tv for 7-8 years. I do watch some shows on the internet but pretty infrequently so the laptop works great for me. I like how your unit has storage for your pretty pottery. I love your solution! Decorating without a TV must be a total joy and I'm completely envious. Thanks! I think my favorite part is the hidden wires. Wires ruin everything for me! I totally hate bun feet. I feel your pain.Your customizations sound amazing! I agree, finding a piece that you feel good about sawing into is so liberating and can be a major influence in getting something perfect. The work you've done to hide everything sounds perfect. I think just the TV on top with other things hidden can look super good too. Why can't all these things be wireless yet? Powered magically from my will to make them run. Argh, tech. Sounds like you have quite a bit to contend with too! !